It is with great pleasure to inform you that Friends of Information Resource Centre (FIRC), Universiti Teknologi PETRONAS (UTP) will organize an event called UTP Open Chess Competition under IRC Carnival 2010. Therefore, we would be very honored if you could participate in the program and help to make this program more successful. The objective of this event is to discover young talents among students around Malaysia that can play chess well with a critical mind, to enhance the relationship between private and none private universities in Malaysia, to produce students that is not only excellent in academic but also with a healthy mind that is able to think critically and also to expose the students with Malaysia chess players and the benefits they can gain by playing chess. From the knowledge and experiences shared through this event, students and also participants can improve themselves towards being a better generation with a critical mind for the future. Time : 8.00 a.m. to 5.45 p.m.
For your information, we have targeted total number of 300 participants for the event which consists of universities students, staff and lecturers from other universities and also members from chess clubs around Malaysia. Therefore, we would be grateful if students of staff from other universities would come and be part of us by becoming the participants for this competition. Not only students are invited but also any staff that is interested in joining this competition. You can read the details of the competition at attachment 1.0. We are looking forward for your positive feedback and we are pleased to provide more information if it is necessary to give you a clear picture about the event. A proposal is attached together with the email. Your utmost cooperation and participation will make this event to be remembered. We hope to hear from you as soon as possible and hopefully before 21st January 2010. 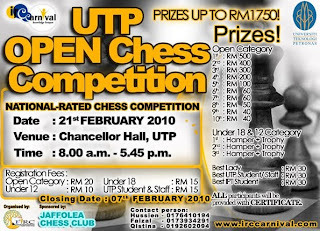 We personally welcome you to join UTP OPEN CHESS COMPETITION 2010.